Amy and Cliff Marini of Long Valley are known for their inspirational lifestyle. Their son and daughter were diagnosed with a very rare and terminal genetic aging disorder, Cockayne Syndrome, four years ago. It affects one person in every one million. Lucas, 10, and Lara, 8, can only be outdoors for a short period of time because they are light and temperature sensitive. They also have mobility challenges and cognitive delays. Amy and Cliff were devastated by the diagnosis, but Amy was determined to fill their children’s lives with joy and developed a bucket list of exciting adventures. This brilliant idea has enabled the family to focus on planning fun activities and to live very full lives. Through their affirmative approach to living, the Marini family has been instrumental in spreading awareness of Cockayne Syndrome as well as demonstrating how to create a life of positivity and happiness. The family has 789 admiring followers on their Facebook page called Marini Bucket List where they showcase their escapades. Lucas and Lara have memory boxes full of mementos from all of their adventures. Some of the bucket list items they’ve fulfilled so far are traveling to London, going to Dollywood, visiting Niagara Falls, rock climbing indoors, riding a ferris wheel, water skiing and tubing, playing sled hockey on an ice rink, riding a train, flying in a hot air balloon, throwing out the first pitch for the Somerset Patriots, attending summer camp at High View Farms, seeing The Lion King and Wicked on Broadway, visiting a police station, touring a firehouse and riding in the fire truck, driving go karts, meeting the famous hippo Fiona at the Cincinnati Zoo, participating in the Special Olympics, bungee jumping indoors, indoor skydiving, visiting Times Square and hiking the Appalachian Trail. The Marinis are always traveling and frequenting fun places. 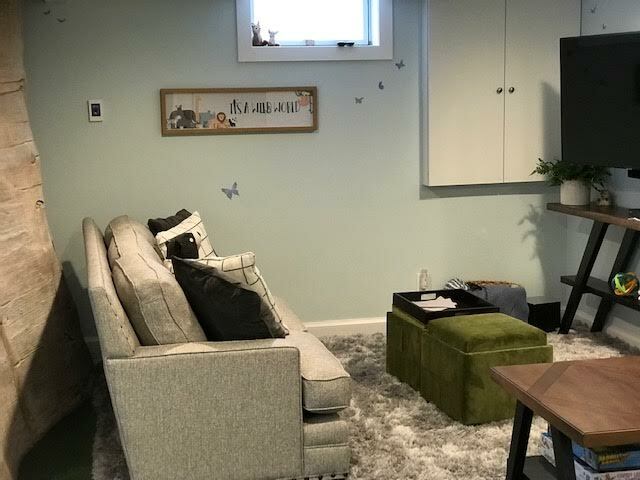 They had wanted to remodel their large basement into a playroom but with 3 children and their hectic bucket list schedule they hadn’t had a chance. That’s where George to the Rescue came in. George Oliphant, a Montclair resident, hosts the Emmy winning NBC television show called George to The Rescue. He and his contractors renovate family homes and other buildings nationwide to adapt them for people with special needs. 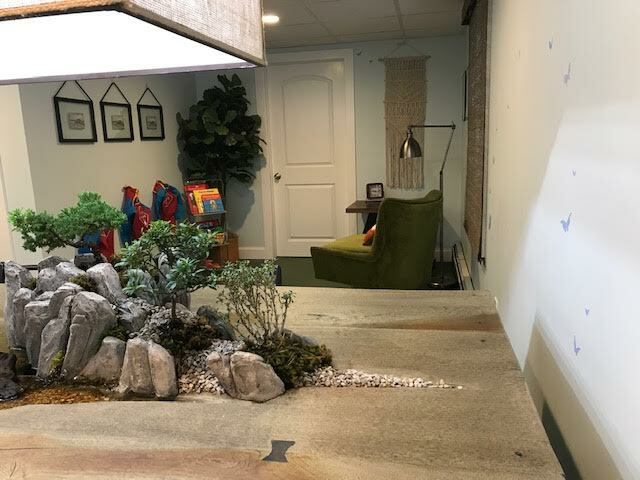 When he heard about the Marini family he contacted them and asked what their ideal playroom would consist of and then devised the perfect space for them: a room that brings the outside world inside because Lucas loves bears and both children adore animals and nature. The family was banned from the basement during the renovation until the playroom was completely transformed. The project began on January 7 and Oliphant chose February 28, Rare Disease Day, to reveal the new playroom to the family. 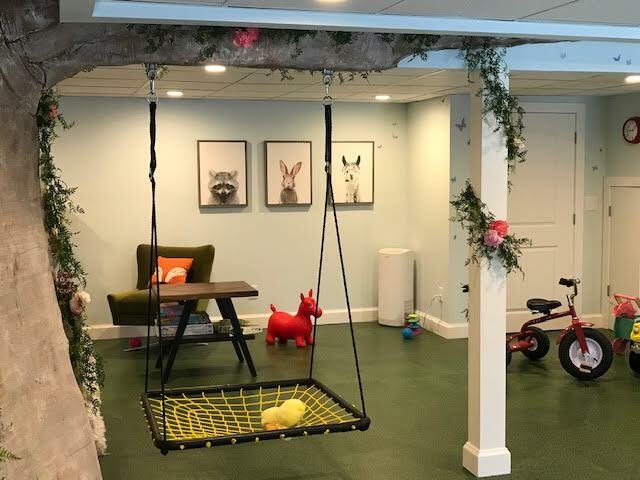 George told Cliff and Amy, “your kids touched my heart” and that he was happy to create a safe playroom where they will have fun without worrying about prolonged exposure to the outdoors. Lucas and Lana are thrilled with their new play area and their little brother Leyton loves it, too. Now they have the perfect place to play when they aren’t out checking items off their bucket list. Meet the inspirational and adorable Marini family and see George to the Rescue’s beautiful makeover on April 13 on NBC.